Today's lace is in the form of a gorgeous hank of laceweight alpaca yarn. 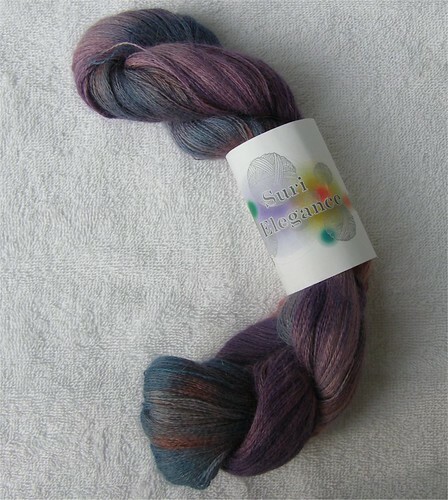 The yarn is Suri Elegance 100% alpaca, and color is called Desert Bloom. There are 875 delicious yards in this hank. I have no idea what this is going to become. For the moment, I'm content just to pet and admire this yarn. It appreciates the attention, as long as I refrain from drooling all over it. This yarn was purchased at my now favorite LYS, In Stitches. The owner told me this is a line of yarn she's adding to her store. Uh oh for my budget! Thanks to the MS3 KAL, I've become obsessed with lace. In fact, I'm so obsessed that I've joined two new lace KALs: the Secret of Chrysopolis KAL and the Secret of the Stole KAL. That should make for an interesting fall, don't you think? 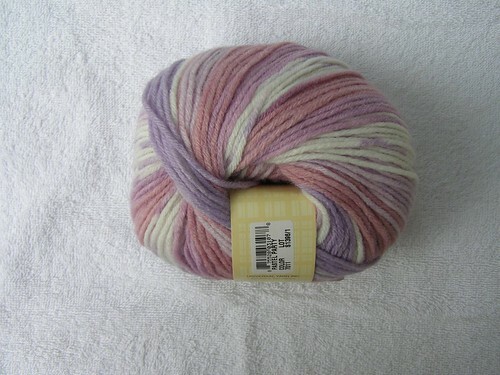 I've ordered some lace weight yarn from Little Knits and have my eye on some more from Knitpicks. I'm also working on a few other projects, two of them Christmas presents. I'm making Cozy for my brother's girlfriend in a navy colored Silky Wool. I'd started another stole in this yarn, but it wasn't turning out very well. Cozy is one of my favorite Knitty patterns, and it is working up well with this particular yarn. I added more stitches to make the stole a little wider than the pattern is written. My grandmother will receive a Spiral Nebula Shawl for Christmas (I hope!) made from Universal Yarn Classic Worsted Tapestry. I'm using color 7011 because it combines two of Grandma's favorite colors--pink and purple. I'm getting a more blended coloration on the Spiral Nebula than the swatch shows. Normally, I avoid yarn with such a high acrylic percentage like the plague. However, when you are knitting for a woman who is close to 90 years old and not capable of handwashing, you get more "adventurous" in yarn selections. This yarn isn't too bad, but the pattern is so mindless that it nearly puts me to sleep. I do like the spiral effect and the little eyelets around the top of the stole. Those are nice touches. Finally, I'm playing around with some handspun merion/tencel yarn that I spun on a drop spindle. The yarn colors are gorgeous, but the yarn is so overspun! 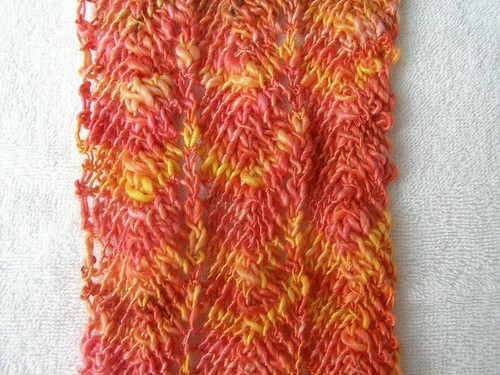 I'm trying to make it into a feather and fan scarf. So far, so good. I feel as if I'm meeting myself coming and going these days. Life seems like a whirlwind. Daughter is heading out on a retreat later this week, so maybe I can slow down a bit. I really don't like to post without pictures, but that's just the way it is these days. Sorry about that. We spent the weekend at school for a soccer tournament. It was fun but tiring in particular because of the heat. We've had triple digit temperatures here for at least the past couple of weeks. It seems like forever. Fall can't get here soon enough for me. I'm plugging along on the last clue of MS3. I've ordered this set of blocking wires and hope that shipping won't take too long. Unfortunately, the order has to be mailed with a check or money order, so that adds more time to the process. This looked to me like a great deal on the wire set, though, so I will try to be patient. If you've not seen a MS3 completed, you must take a look at Turtlegirl's modeled photo of her stole. Gorgeous, huh? I love the asymmetry of the stole. That aspect just adds something special to this pattern. I've seen some photos of the stole worked symmetrically, and frankly, it looks dull to me. I'm about as OCD as they come--things must be precise, symmetrical, exact--but I forced myself to relax a bit with this stole and knit it as written. It certainly isn't disappointing. The Internet is buzzing with talk of SAFF and plans for blogger meetups. Jen of JenLa has a reference page for those of us here in the southeast providing information about who's attending, etc. If you're going, ask Jen pretty please to add your name to the list. Those of you on Ravelry will also find SAFF chatter in several forums. Katey is trying to arrange a place for all of us to arange our take over meet at SAFF. It's too freaking hot here to go outside and take pictures. I'm sorry; I don't get to be in charge of the weather, or it would be sunny, cool, and breezy. Suffice it to say that I'm still knitting the Monkey socks, but they are on hold until I can duct tape Daughter to a chair and get her to try them on for length. I've also resurrected a UFO scarf from my project basket. It's a skull and crossbones illusion scarf I started in January. 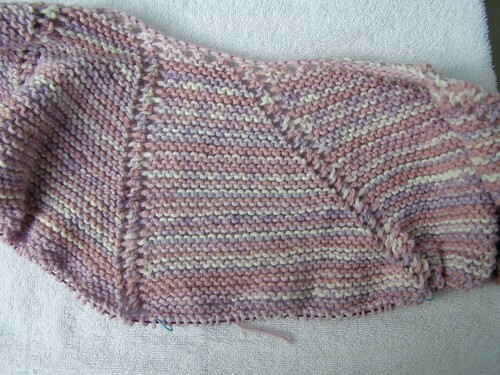 I'm half way done with it and hope to finish it off before too long...if I can just figure out the last row I knitted. Who else is anxiously waiting for the release of the final MS 3 clue tomorrow? I can't wait to finish this one up and see how it turns out after blocking. I am honored. Beverly has been a friend for a long time. We met by chance in Hook 'n Needle in Columbia. She's the one who is responsible for my learning to knit socks, because she took the time to demonstrate the magic that is turning a heel. Now, it's my turn to nominate some Rockin' Gals for this award. First, my friend Carolyn. I've had the pleasure of visiting with Carolyn in person, and she rocks just as much in real life as she does on her blog! My next nominee is Sherry. Coming soon....progress photos, I hope, and maybe even some FOs. I've been busy getting daughter into HIGH SCHOOL this week. My baby is growing up. Record Breaking Temps? I Believe!! We broke a high temperature record here yesterday. It was 104 degrees! The previous record was 102 degrees, and that was set over 100 years ago. Our AC ran all day long. Boy, I can't wait to see that power bill. 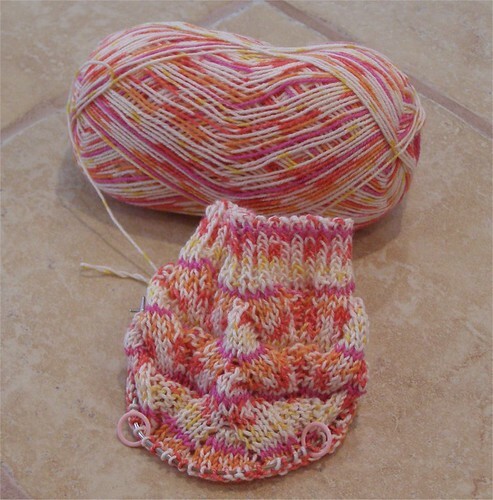 The Monkey socks were ripped out and re-knit on a size 1 needle. I finished up 4 pattern repeats on the first sock, so that brings me back to where I was previously. The fabric looks better on the smaller needle, but I still need to run some waste yarn and try the sock on. Someone will get a new pair of socks out of it, and I hope that someone will be me. Daughter is hoping that she'll be the recipient! Bev, the pattern really isn't hard. I think it would be a great one to try if you're ready to step up from basic socks. Y'all say some prayers for me today! I'm spending the day back to school clothes shopping with Daughter. It's hard to say how this will go--I haven't been able to gauge the hormonal levels yet today! ha ha! If I survive this, I'll post some knitting photos later this week. 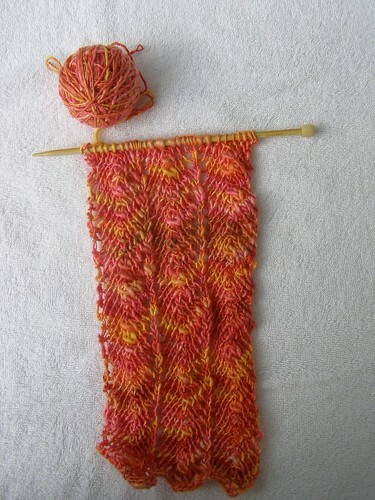 My Monkey sock is coming along great. I'm surprised and pleased at how fast this pattern is to knit. I finished 3 pattern repeats last night. I'm using Sockotta 6670 (scroll way down on this page). I like the yarn colors; they are so happy! My only concern with this pattern is that it's cast on 64 on size 2 needles. I may be underestimating the size of my foot, but I think these are going to be too big. The pattern calls for 6 pattern repeats for the cuff. I think I'm going to go with 4, possibly 5, because I like a shorter sock. I'll try it on at that point to see if the cuff is baggy, if so *ribbit* and start over. My Bee Fields shawl kit arrived today!! I haven't been able to get a good photo of the yarn that is true to color, so I'll try again later. It looks divine!! Can't wait to start this one. Daughter has been at Cheerleader camp at Appalachian State since Wednesday. I cannot put into words how much I missed that kid. What am I going to do when she goes away to college?? Yes, that's 4 years away, but given how time sprouts gigantic wings and flies, that 4 years will pass in no time. Camp went great according to all reports. The girls won several Superior ribbons and one Excellent ribbon for different evaluations. They also brought home a trophy for Best Dance Routine for a Small Varsity Squad. What an excellent way to start off a new season. My Namaste Messenger Bag is delightful. Husband just could not muster up any excitement about it when I showed it to him, but Daughter oohed and ahhed over it and decided she wants one, too. We definitely both have the "bag" gene. I finished the most recent clue for MS 3 this afternoon. I had an "oh crap" moment last night and had to rip out an inch of Chart H. I was 5 rows from finishing the chart and dropped the last stitch on the purl 2 together. It wasn't pretty, but at least I didn't loose the entire two days of knitting. I'm now patiently (yeah, right) waiting for Friday and the next clue!! In case anyone wonders, yes, I'm knitting the wing. This evening I cast on a pair of Monkey Socks. The pattern is great! I've been wanting to try a Cookie A pattern for a while now, and since this was a freebie from Knitty, how could I go wrong? We made the rounds of the two LYSs yesterday. First stop was Knit Together to exchange some Blue Sky Cotton I had left from my Tomato. I had 3 entire skeins left and wasn't apt to use them for anything else. I got some yarn for a feather and fan type shawl for my grandma instead. The next stop was In Stitches (no website, but great store. You should go.). 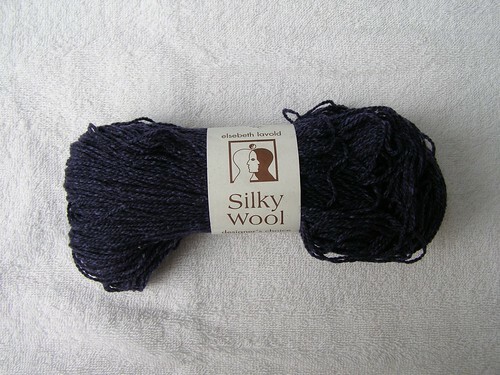 I picked up several skeins of Silky Wool to use for a lacey stole for a friend for Christmas. 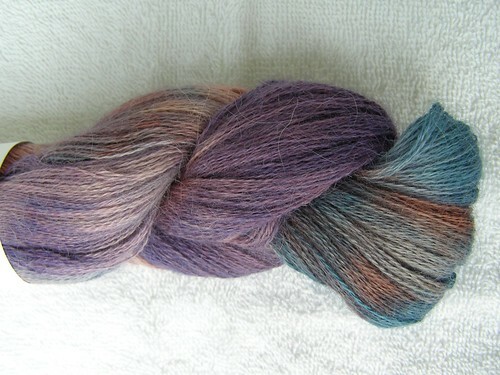 I also HAD to have a skein of the most delicious lace weight alpaca in the world! I'll try to take some pictures this week. We have a busy week ahead--the last one before back to school--but I've planned some time off work to just relax and hang out with the kid. I really didn't mean to be away so long. Life has been busy! What with work, playing cab driver to a teenager, and trying to slip in as many trips to the beach as possible, there hasn't been much time for anything else. The MS3 is coming along nicely. I'm eagerly waiting for Clue 5 which comes out this week. 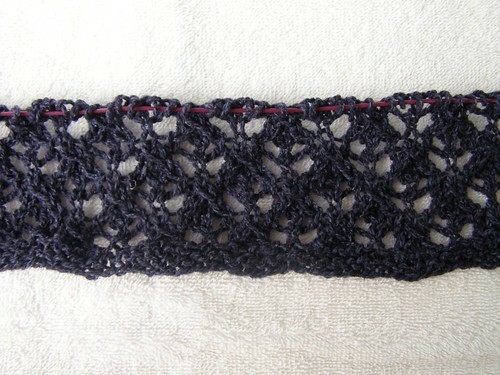 The stole is just gorgeous so far, and that's due to a well-written pattern, not my genious lace knitting skills! I finished up Clue 4 last week, so of course I had to have something else interesting to knit. I cast on a Diamond Fantasy Shawl in KP Shimmer and am continuing to work on lacy scarf in Handmaiden Sea Silk. Both of these are turning out great. Maybe I can manage some progress photos before too long. It is way too quiet in the house today due to the fact that there is no teenage girl here. She headed out at the ungodly hour of 6 AM this morning for cheerleading camp. Yes, daughter dearest will be a varsity cheerleader this school year. She's terribly excited, and of course, I'm excited for her. She's not an athlete but has tried a couple of sports in middle school, not into the politics of student council... She is an artistic type, one of those kids who walks about a foot off the ground, has a song in her head all the time, and is generally happy all the time. I think my baby has found the "mothership" in cheerleading--these girls are her kindred spirits. School starts in two weeks. That is just too soon as far as I'm concerned. It's been so nice having daughter home with me during the days. Time is just racing by until the day she graduates high school, goes off to college, and slips into adulthood. It seems like only yesterday she was my tiny baby girl, and now, she's quite the young woman. OK, I'm getting weepy, so let's end this post on a positive note. I'm stalking the mail box! Why? Well, I have this amazingly beautiful shawl kit on order. I chose the golden color yarn because it reminds me of honey. My dad kept bees, and husband has a hive, too. This shawl will remind me of two of the most important men who've been in my life. I got a "bonus" of sorts at work recently, so I decided to treat myself to this. I justified this purchase by reminding myself that I have a $50 yarn shop gift certificate to spend, and my stash is getting large anyway. I've had a major case of lust for this bag since I saw it. Mine will be in cranberry.